You can really never have enough chicken recipes. Am I right or am I right? Get ready to add this amazing chicken cutlet recipe to your arsenal. They are crunchy. They are flavorful. And they are FAST. Yes, I know that breading chicken can be a pain. But trust me, this is pretty darn simple. And even though it’s breaded, it’s surprisingly healthy. The secret to getting this chicken super crunchy without drying it out is the cooking technique – start it on the stove top to get the outside nice and golden, then throw it in the oven to cook through. I love this method and use it for every kind of meat. Just make sure you have an ovenproof skillet! 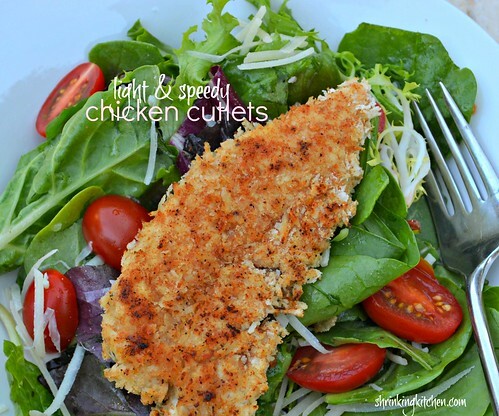 Try these chicken cutlets atop a salad of mixed greens dressed simply with a little olive oil and lemon juice. Forgo the chicken nuggets for the kids and serve these up with some sweet potato fries. Pound chicken tenderloins to about 1/2 inch thick between two sheets of waxed paper. Heat oven to 350F and a large ovenproof frying pan on the stove on medium high heat. On a plate, mix bread crumbs, flour, garlic powder, lemon zest, salt and pepper. In a shallow bowl, mix egg whites and water. Add the olive oil and butter to the frying pan - watch that it doesn't burn while you're breading the chicken! Dip each cutlet first in the egg white mixture, then in the breadcrumb mixture. Press the breadcrumb mixture into the chicken for maximum coverage. Place each cutlet into the frying pan. Fry for about a minute, until golden, then flip. At this point, place the entire frying pan in the oven for about 10 minutes to finish cooking. Be super careful when removing from the oven! Let cool for a few minutes and serve! I’ve made these cutlets a few times now. Maybe I’ve used more butter/oil than the recipe calls for, but it’s still a much better alternative than drowning them in oil. The cutlets always come out tender and flavorful and the lemon zest is a great addition. I can always taste a bit o’ lemon! So glad you like them as much as I do! Thanks for taking the time to come back and leave feedback!